Final is a respected Japanese manufacturer of premium-quality headphones, earphones, and other audio products; the company enjoys a reputation for technology-driven but always music-centred product design, a great example of which is the revolutionary D8000 planar magnetic headphone reviewed here. Final’s aim with the D8000 was to create a ‘best of two worlds’ design that would offer, “...the sensitive high ranges of planar magnetic models and the volume and open-feel bass tones of dynamic models.” Consequently, Final took a ‘clean-sheet-of-paper’ design approach for the D8000 and effectively wound up reinventing planar magnetic driver technology in the process. Each D8000 driver features two sets of ‘doughnut-shaped’ magnets, with one magnet ring placed just to the inside and the other to the outside of the voice coil traces. Importantly, each driver features front and rear-facing sets of magnets (for improved efficiency and lower distortion) positioned to minimise sound wave obstructions. Magnetic fields from the front/back and inner/outer magnet rings combine to create an evenly balanced magnetic field across the voice coil surface. Finally, the D8000 driver uses an air film damping system the design for which was suggested by Dr Heitatro Nakajima, a microphone specialist who lead Sony’s Compact Disc project and who collaborated with Final on the design. The system places perforated metal screens a precise distance away from the front and rear sides of the diaphragm to provide a semi-constrained layer of air between the diaphragm and the outside world. Sound waves pass through the screen perforations, while the openings in the screens offer a just-right amount of resistance to provide critical damping or “braking” for the diaphragm. The sonic benefits of the system are readily apparent. Straight out of the box, the D8000 offered astonishingly fine bass and midrange performance, but with upper mids and highs that initially seemed a bit reticent or subdued. 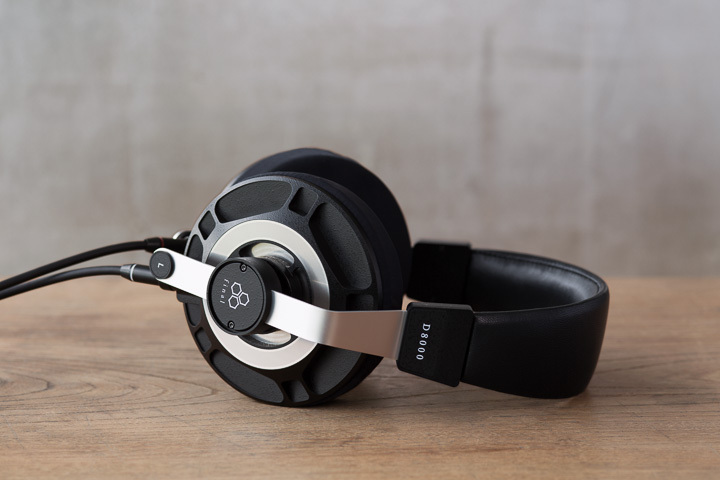 However, after several hours of run-in time the D8000’s mids, upper-mids, and highs opened up magnificently, so that the headphone’s tonal balance became pleasingly neutral while its overall resolution, transient speed, and focus took dramatic steps forward. Stated simply, the D8000 combines in roughly equal parts the following qualities: accurate and neutral voicing, high levels of resolution, superb transient agility from top to bottom, finely shaded dynamic contrasts, energetic expressiveness and impact—all with remarkable freedom from audible ringing, overshoot, distortion, or compression. Listening through the D8000 can be a revelation; it lets listeners hear recordings in their most pure, unexaggerated, and unadulterated forms—as if the slate suddenly has been wiped clean of a thousand small sonic obstructions, leaving just the music behind. To appreciate the D8000’s superb resolution and expressiveness listen to Imogen Heap’s witty and deceptively complex song ‘Bad Body Double’ from Ellipse[RCA, 16/44.1], which contains a heady mix of natural, synthesized, and electronically processed sounds. The song combines funky and intricate riffs with high-energy rhythms, while Heap’s wry lyrics refer to her being her own ‘bad body double’. The D8000 effortlessly teases out the sophisticated multi-layered sounds used in the track while highlighting Heap’s feisty, self-deprecating humour. What is more, the D8000’s reveal a cool sonic detail that sets the stage for the song: namely, the fact that as the track opens Heap is softly working out the lines of the song as she sings to herself in the shower (!). Few headphones have captured our attention and musical imagination in the way that Final’s D8000 has. It is a breakthrough design that has an uncanny ability to capture the essence of the music while pushing the usual sonic obstructions aside.